Price reduced ... titles issued and ready to go... enviably positioned in one of the most convenient locations in this coastal suburb, this unique north facing block is ideal to build your dream home. Surrounded by a picture-perfect golf course, some of Perth's finest beaches and a brilliant shopping precinct this prime opportunity won't last long. Light-filled, with generous street frontages onto Pascoe Street. * Pristine Trigg and Scarborough beaches just minutes from your doorstep. * Explore the local Trigg bushland nature trails nearby. * Scarborough Beach entertainment and leisure precinct (5 min drive away) with its multimillion development including new restaurants, Olympic size pool and surf club. 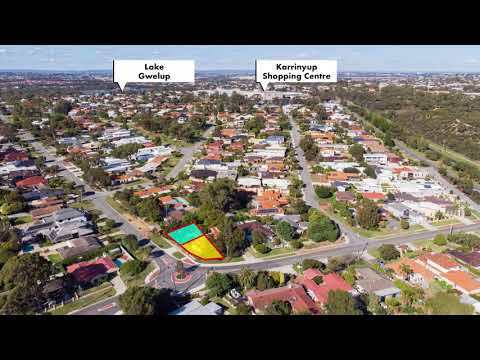 * Close to Karrinyup Shopping Centre precinct (10 min walk) with its $600 million-dollar redevelopment commencing soon. * Close proximity to Karrinyup Road, Reid Highway and public transport. * Walk 400m to Karrinyup Primary school or 10 mins to St Mary's Anglican Girls' School. Secure your position in this highly sought-after lifestyle location and design your dream home in the lead up to settlement.